Kathryn Bernardo fulfills her personal dream, which is to have her own makeup line specially made for morena beauty. Kathryn Bernardo is thrilled to finally say she has created her own makeup collection. "Whether mestiza, medium-toned ka or morena, this will fit you," the 23-year-old actress told PEP.ph (Philippine Entertainment Portal) and the press prior to the short program held during its launch on August 18, at SM Megamall Fashion Hall. But her makeup line was specially made for girls with morena skin. 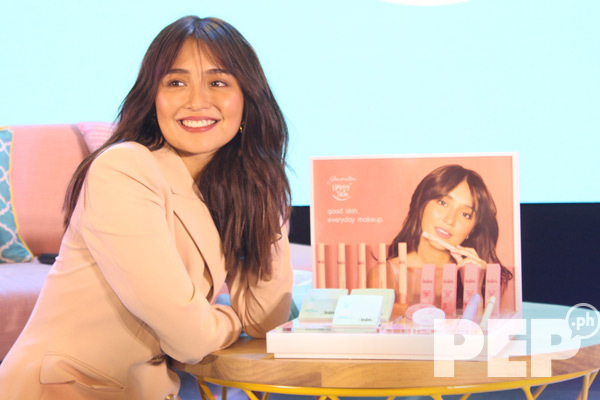 Kathryn continued, "I tried it myself personally and mapo-promise ko sa kanila na it’s very good, especially for morena girls, the Filipina girls with morena skin tone. "Being morena kasi, especially before, I’ve had a hard time finding the perfect shade for me. "Sometimes it’s a bit greyish, the powder. The shade is too bright for me... I want this collection to be for everyone." In collaboration with local beauty brand Happy Skin, she made sure her products will promote her "less is more" philosophy. She said, "Lalo ngayon na ang daming misconceptions na when it comes to makeup, dapat masyadong maraming ganyan. "But at the end of the day, kailangan makeup naman is less complicated na they have to see the real you. "Kailangan lang i-enhance yung features mo...being you, being authentic." When asked during the group interview about a beauty hack she learned from her makeup artists, Kathryn immediately suggested rubbing ice cubes on your face before putting on makeup. Kathryn said, "Naging routine siya sa akin kasi feeling ko nako-close niya iyong pores ko before putting on anything. So, any cold towel or ice before putting on makeup. "Feeling ko mas kumakapit iyong makeup at mas nare-refresh yung skin." The actress-turned-entrepreneur also pointed out the importance of mascara in a girl's makeup routine. She said, "Mascara for the eyes kasi ang laki nagagawa ng macasra para mabuhay mata mo."